I know it's been a few days but damn, it's hard to come up with these shoddy cartoons when I am getting almost all my hits from the same 3 or 4 terms. I did have one cartoon half completed, til I realized one of the relevant words was actually something else entirely. Problems! In other news, as you may have noticed, Christmas is approaching. I am not exactly looking forward to it this year, as you might guess. Unfortunately it's not the kind of thing you can easily ignore, what with the music being played on every single radio station and the 75 foot (roughly) tree in the lobby of my workplace. I do have a mini-vacation to look forward to, right before it though. I will be spending a few days in the place any Minnesotan would love to go to in the middle of winter, Detroit. Kind of a lateral move really, aside from the increased probability of being shot. In any case, on with the crap-show. 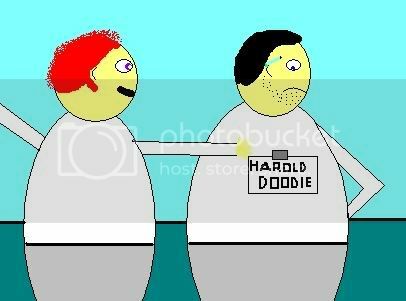 Yikes, Harold has kind of porked out, hasn't he?